This is perhaps one of the most fundamental tips. If you want to sell albums, you’re going to have to be able to show albums. Buying is an experience, and you want to be giving you clients an amazing one. With a beautiful album in their hands, they’re having an tangible, real experience. They can feel the weight of it, the texture of the cover, run their hands over the pages and feel the quality. They’ll instantly know that this is a book worth an investment, without you even saying a word. With samples, make sure to get something big and impressive. Choose your very best work to go in there (it’s going to be viewed over and over, so you’ll want it to really show how awesome you are). Design it exactly how you’d like to design. Make it your perfect album, so they’ll have an idea of what to expect when you create theirs. When you’re actually out there shooting, make sure you have the album in mind! To create an album you’ll need a lot more photos than if you were aiming to sell a single wall canvas, or a handful of gift prints. Albums require storytelling images, sequences, action, and supporting photos. And most of all, you need a lot of variety so that you can create enough interest across a whole album. If you present your clients with 30 or more images that they absolutely positively can’t say no to, there’s really no other option than to display them with an album! Start talking up your albums as soon as you can with your clients. Let them know that you really love creating albums, tell them all the juicy details about why your albums are so fantastic, and how it is the perfect product for your sessions. Really communicate the benefits of owning an album to them, and get them thinking about it right from the get go. You can even talk it up during the shoot. Say things like “Oh that shot is going to be perfect for an album cover!” or “This will look AWESOME as a full page in the album”. Have them always thinking about that album, so that when it’s time to purchase, they’ve pretty much already decided on an album. This might be one of the most effective tips of all. It’s simple. For each and every client, pre-design an entire album. Make it a fantastic design that really tells the story of the shoot. Then present it to your clients at their ordering session and see if they’d like to buy it. Simple! There are far too many questions that might prevent them from actually purchasing an album, and too many ways to talk themselves out of it. If you present a fantastic design, you instantly remove all those questions. Suddenly it’s “Wow, that is wonderful! Those pictures go so well together! It really does tell the story perfectly”. Pre-designing is key to increasing your album sales. Make the time to do it, and you’ll see more and more happy clients walking away with albums in their hands. We’ll finish off with a more touchy-feely, but equally important idea. You have to believe in the value of the album. Sales is not about tricking people into buying something. Not at all. It’s about helping your clients find the best way to show off the amazing photos you created for them. And, more often than not, with the modern photojournalist/lifestyle method of shooting, an album IS the absolute best way to show off the photos. Albums tell stories, they stand the test of time, they’re easy to store, and you can pull them out and relive that day for years and years to come. Holding an album in your hands will always be more of an experience than flipping through a folder of images on a computer. Albums matter. And if you deep down believe that, your clients will believe it too. 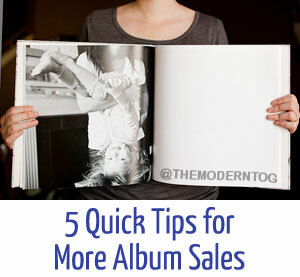 So figure out if albums are really right for your clients. More often than not, they absolutely are—especially when you’re delivering a ton of amazing images! Then help them learn about albums, show them why they’re so awesome with a sample they can hold, present them with a design of their very own images, and presto! 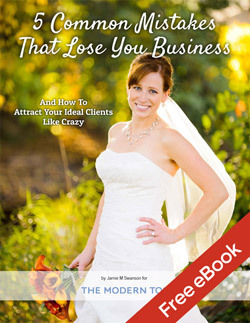 You will have happier clients who are in love with their new album, and more sales for your business.